Amish furniture is known for the quality, handcrafted craftsmanship that goes into building it. Not to mention, the finest of kiln-dried American hardwoods are used to construct it. There are no assembly lines when it comes to creating this type of furniture. And the detailing and hard work that goes into it cannot be duplicated by any tool. So, obviously, the same level of quality standards goes into crafting Amish tables. An occasional table is, as the name might imply, a table that is used less often than, say, a dining room table, although, a coffee table can sometimes be considered an occasional table. Generally, these are smaller tables. Most commonly, these are end tables for a sofa, couch or love seat. It may also be what someone has in their room on one or both sides of the bed, if these are in place instead of night stands. Amish tables make fine occasional tables. Plus, you can shop for fine Amish occasional tables at the Amish Originals Furniture Company showroom in Westerville Ohio. There you will find accent tables, coffee tables, end tables and sofa tables for your home to match your style and décor. Choose from several quality American hardwoods and finishes. Plus, get advice from our knowledgeable staff on what will best work with the size of the room where you want to have an occasional table. Dining rooms have traditionally been the meeting place where families could gather and, over dinner, share stories about their day. While the tradition is starting to become more of a rarity, those moments when it does happen are treasured moments. So, it is only fitting that one should have the best looking and finest quality dining room table in place to fill this precious space. 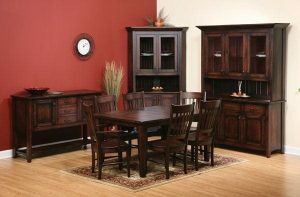 When choosing an Amish table to meet your dining room needs, you will have to consider a few things. The size of the room you are working with, as well as how many guests you would like to be able to host with your dining room table will determine the size and maybe the shape of table that will be the best fit. Of course, it’s also about the style you want or need. You can choose from traditional, pedestal, trestle and pub tables for your dining room. At Amish Originals Furniture Company, you will be able to choose the type of wood and finish you want that best suits your style for your unique home. Then, your Amish tables are tailor made for you. You know when you choose your dining room and occasional tables from Amish Originals that you will be getting the best in dependable, durable and divine looking furniture. The craftsmanship that goes into the tables is unbeatable by any standards. You aren’t just buying furniture; you’re investing in quality Amish tables that will become heirlooms to be passed down through the generations.